A mockup of the newly-approved "Big Bang Theory" LEGO set. Bazinga! Fans of TV's "The Big Bang Theory" and LEGO are getting a wish granted. The characters and set of the popular television show are going to be made into a new set as part of LEGO Ideas. 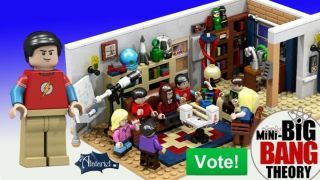 Ten thousand "Big Bang Theory" enthusiasts and LEGO aficionados voted for the set based on the TV show, and LEGO representatives have tapped it to be made into a new set. "The set represents the living room of Sheldon Cooper and Leonard Hofstadter, which is the core location of the series," the creators of the project wrote in a description. "It's filled with geeky details accurate to the show including Sheldon's board, Green Lantern lantern, Rubik's cube tissue box, DNA model, mini LEGO Death Star and more!" Follow Miriam Kramer @mirikramer. Follow us @Spacedotcom, Facebook and Google+.